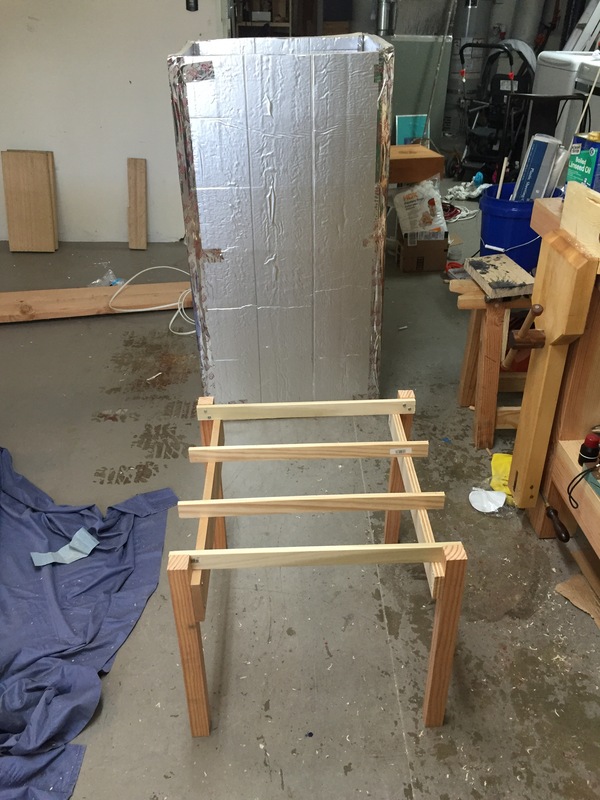 As I mentioned a while back, my euclyptus seat boards are still really wet so in between coats of schellac on the table base I decided to start building a redneck version of Peter Galbert’s. 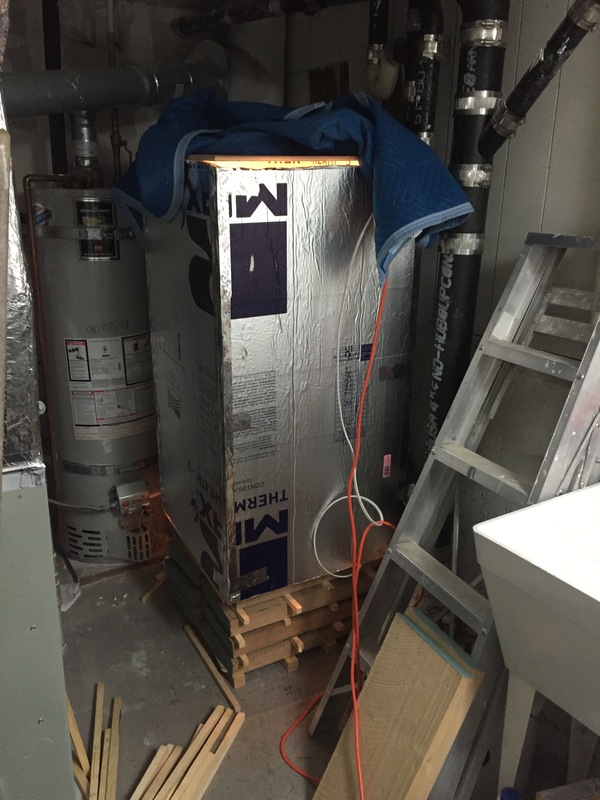 As it worked out, a single 4×8 sheet of clad foam insulation would make a kiln large enough to hold the seat blanks and the eventual crest rail molds. I taped the pieces into a 4 foot tall box. 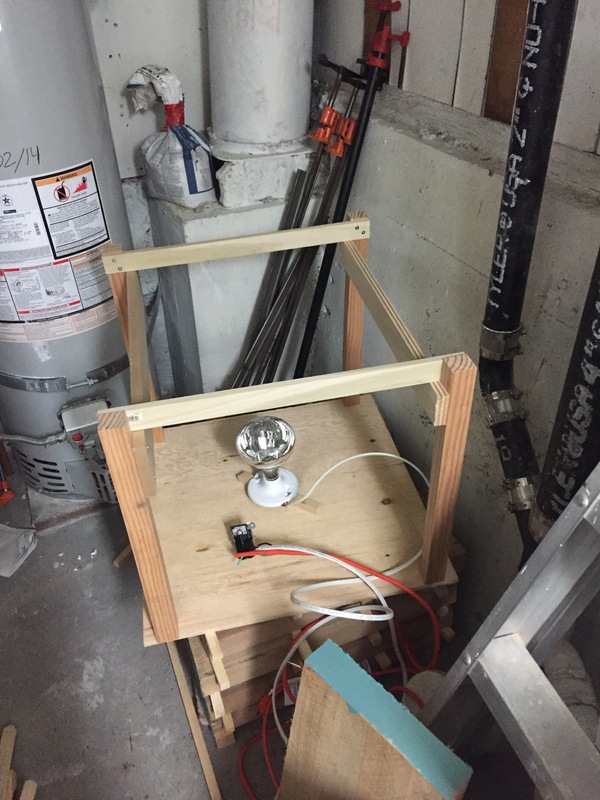 A raid of the scrap pile and I had a frame that fit inside and I mounted a heat light on the base board. The wiring was rigged through a chicken incubator thermostat which right now is hanging loosely under the top board. 4 blacks were placed on the rack, I set it for 90 degrees and after 30 minutes the light had shut off so it seems to work. It still needs some cleanup work but it’s a start. Today I took the day off from work so an electrician could do some work on our house. We are converting the wood burning fireplace to gas (the fireplace would have cost nearly 10k to make operational again) and he installed the electrical outlet for the blower. Hopefully we can get it all done before summer when the fog comes back (it’s not a real Mark Twain quote but the Summers here really are cold here). While the electrician was doing his work, I restacked the drying eucalyptus slabs in a new location and checked their moisture. Most are at 15% but a couple (the bottom 2) are at 20%. I also noticed that some are showing some serious deformation. Hopefully these boards are not experiencing cellular collapse but I won’t know until it is time to mill. Given how wet things are, I’m going to build a version of Peter Galbert’s kiln , using a light bulb for heat, to give the process a kick. Once the electricians work was complete, I walked over to the hardware store to grab a can of spray shellac (I should have bought 2) and on the way back I stopped in the local junk shop. 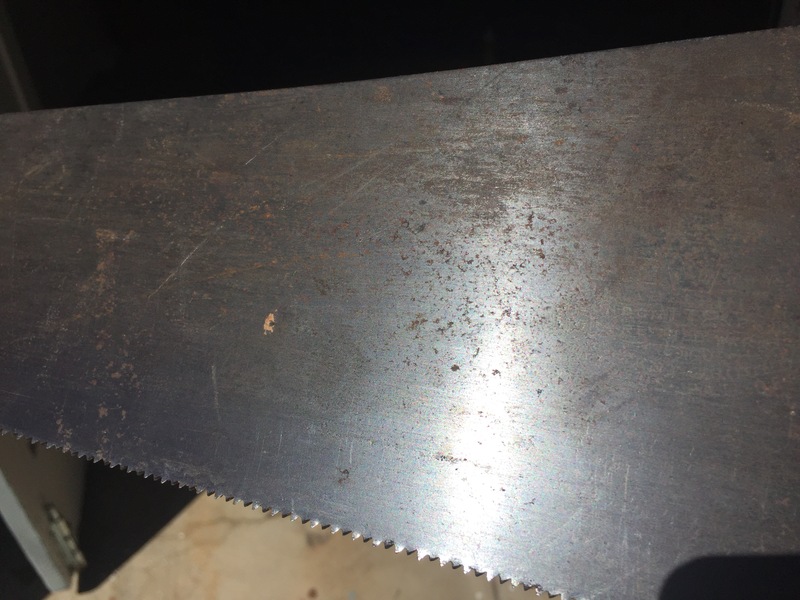 Hidden between two pieces of furniture was a group of rusted hand saws; most were “warranted superior” but there was a single pre-war Disston with wheat handle carving. The edge was straight a the plate was clean enough to barley make out an etch but could not see the model. 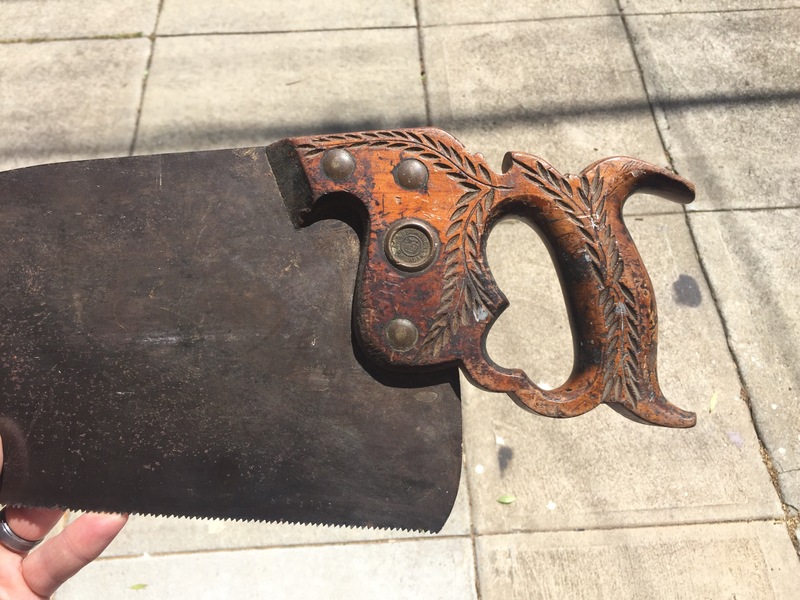 The guy wanted 10 bucks and I may not know much about saws, but I know enough the a pre-war with wheat carvings is probably a decent saw. Well low and behold it’s a turn of the century (1897-1917 based on the medalion) model 112 London Spring steel. Not too of the line but higher end than the ones I have. The blade got a scraping with a razor blade and some work with the rust eraser blocks and it looks like it’s in good shape. The picture does not show it well but it has retained some of its original polish. The handle was cleaned with artisanal turpentine which was followed by 220 and 320 and a coat of BLO. 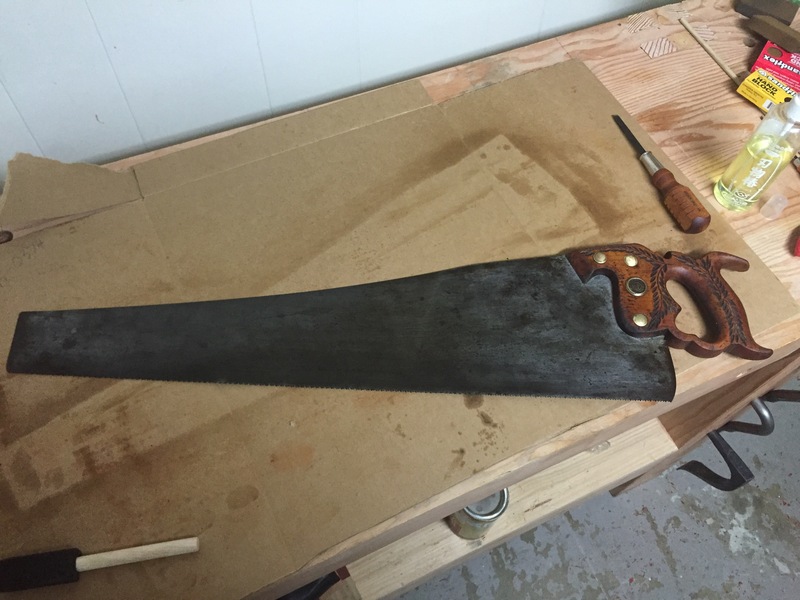 Still needs sharpening and either another coat of oil or some shellac but I think it will make a nice addition to the shop. 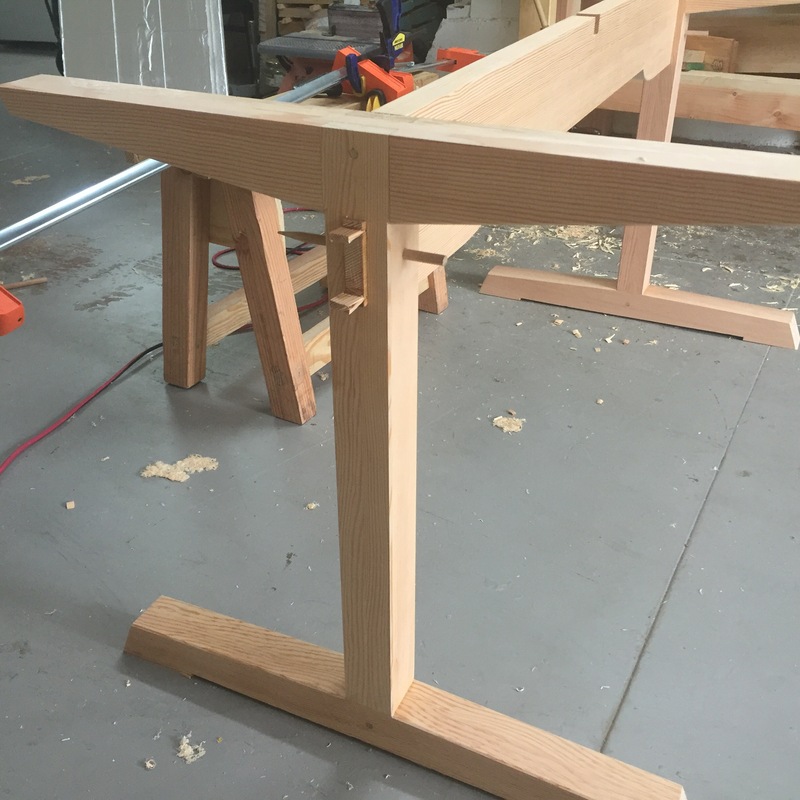 Over the weekend I focused on getting the trestle joints with the legs nice and tight and prepped it for finishing. I used my smother on all surfaces and then used my chamfer shave and low angle block plane to bevel most of the edges on the parts. Once I had the pins and wedges ready it was time to assemble. 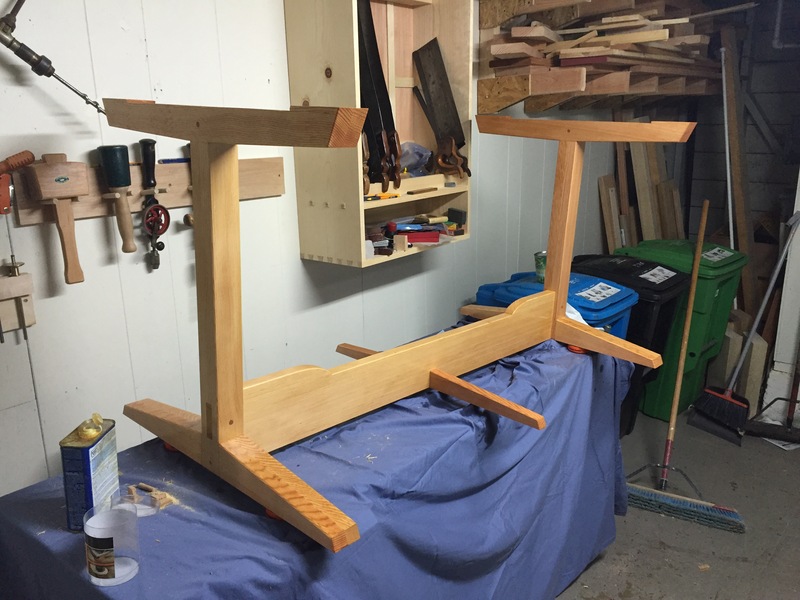 I did not have any long enough clamps but the notch for the middle support gave me one clamping point and I combined two long ones for the bottom of the trestle. The next day it was time to make the middle support, this went quite quickly since it is simply a smaller version of the other two supports. The joint came out nice and right as well. A dowel (drilled at an angle) and some glue hold it in place. After letting everything dry overnight the pins and through tenons were sawn flush and smoothed with the freshly sharpened low angle block plane and a chisel. I then steamed out a couple of dents and used some 220 and 320 grit to clean up any noticeable defects. I ended up putting some putty in the hole created by the blow out, it’s not perfect but this is a softwood table that will be dealing with kids for the force able future so perfection is not needed (years ago that would have been impossible for me). Everything got a nice coat of BLO which was left for 10 minutes and then wiped off. A few defects I missed became visible with the oil but overall not bad. I’ll inspect it tonight to see if another coat is needed otherwise it will have a few days to cure before finishing starts this weekend. The top is going to be finished with water based polyurethane from General Finishes as toddles are a bit rough on tables. I think I will go with spray can shellac for the base since it’s an easy to repair finish and non-toxic. 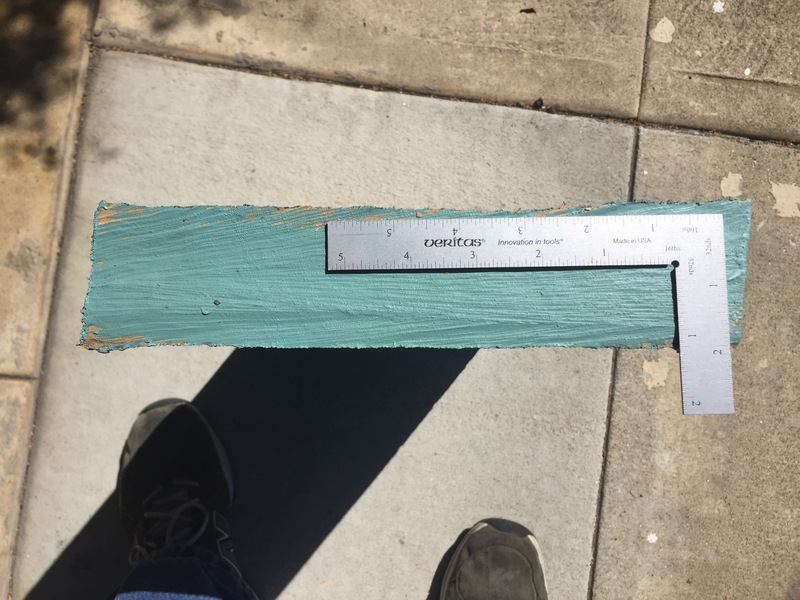 I can’t do laquer in my shop as the entire house smells of laquer thinner even when I do a small test sample and I won’t be able to get the the base into the backyard easily. My shop has become a mess so with the table base currently residing in the house decided to clean up a bit. 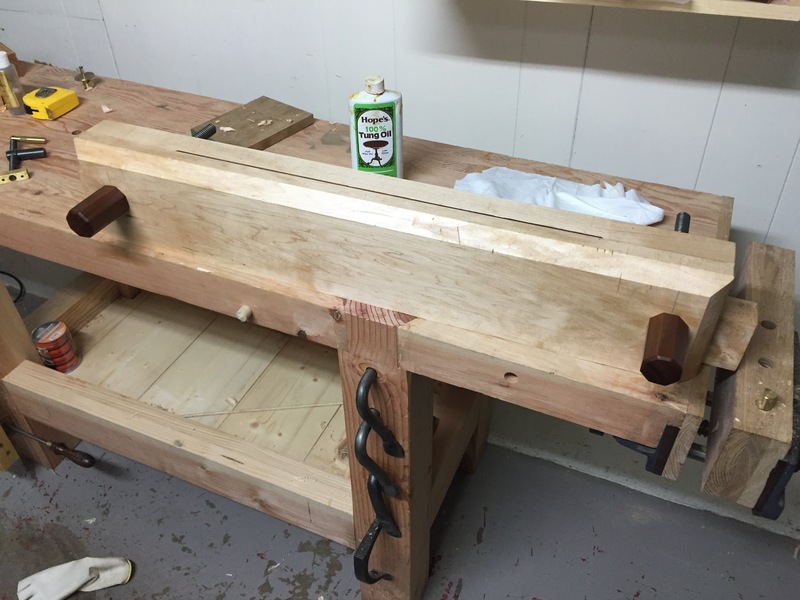 When I pulled out my Moxon vise to clean under it I decided to make some modifications I had been planning. In a recent post on his Popular Woodworking blog, Chris Schwarz mentioned he had made some design changes to combat tipping problems. Since this is one of the problems I keep having I decided to do the same. 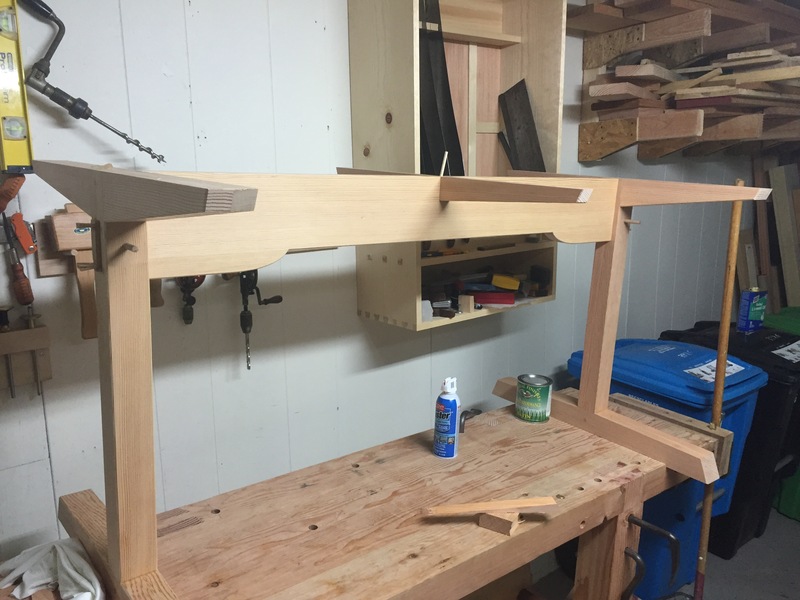 My front jaw extends below the rear jaw, the thinking being to make it easier to line up with the edge of the bench but this was pointless so the extra wood was planned away. Then I extended the chamfer around the edges and applied a coat of 100% tung oil. It will dry slow but I’d rather minimize the darkening of the maple. 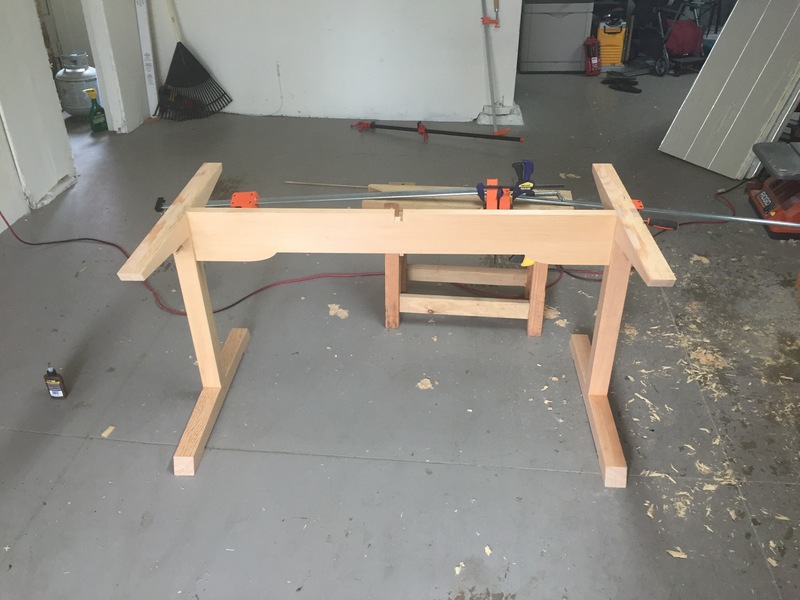 I like it, and before I built my leg vise I used it frequently. My one regret is making the thing so big. I made it large enough to act as a saw vise for a full size hand saw and that has made it a bit tough to store and move.